If this list sounds curiously like Mac OS X, the New York Times' David Pogue would disagree. Of these the edition closest to Windows XP is Vista Home Basic. It does not offer the new windowing system, Aero, like the other editions. Therefore, it has hardware requirements that are less demanding and that are closer to those of Windows XP. It also looks similar to XP. As with Windows XP, Microsoft now supplies versions of Windows that are not bundled with Windows Media Player. This is because the company has been found guilty of anti-competative tactics and monopolistic behavior. In the Vista versions, Home Basic N is the home version without the media player. It is only sold within the European Union. Home Premium is the newest incarnation of Windows Media Center. It is also intended for mobile computing. Business is intended for small business owners. While the PR verbage talks a lot about being perfect for the business, the only application or feature mentioned in the advertisements is better connectivity with Microsoft's office suite -- useful only if the user spends several hundred more dollars for the new edition of Microsoft Office. Again, because Microsoft violated anti-trust laws and competed illegally, it now offers Business N, the Business version without the Windows Media Player. Like XP Starter Edition, Vista Starter is for so-called emerging markets. It is not widely available. Similarly, Windows VistaEnterprise offersfeatures oriented toward large business and is only available for bulk purchases. Windows Vista Ultimate combines the features of Home Premium and Business. Unlike Vista, Ubuntu does not differentiate between its home and business editions. The version homemakers use for things like recipe collection or children use for games is the same version used by programmers in large businesses like Google. The focus of business or enterprise editions - security and stability - is equally available to the home user. Have you signed up for Ubuntu Helps yet? 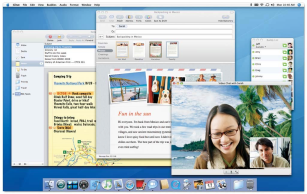 Many people are impressed by the three-dimensional desktop support of Vista. Ubuntu has had this available since early 2006 by manual installation. Starting with version 7.04 in April 2007, it has three-dimensional support included by default. 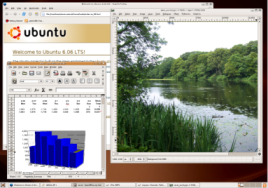 In fact, several parts of Vista's feature set was already implemented in Ubuntu a full year before Microsoft released it: three-dimensional window interface, integrated desktop searching, sidebar, applets (Microsoft calls them gadgets; Apple calls them widgets), creation of virtual memory on-the-fly (i.e., ReadyBoost), as well as excellent multimedia supportfor photo galleries, movie making, meeting space software, and playing and burning both CDs and DVDs. Consequently, one can say that Ubuntu 6.04 is comparable to many Vista features and includes many of its own features like superior security, stability, configurability, extensibility, and networking capabilities. Unlike Windows, Ubuntu offers more than an internet-based updating notification service. With a click of approval, Ubuntu will also download, install and configure those updates, all the while ensuring that your system is not harmed in the process. Unlike Windows, Ubuntu does not need to be trimmed down to be embedded or to work on a tablet PC. It is already small enough and fast enough for that. Also, Linux is already embedded in PDAs and cell phones without major revisions. Also unlike Windows Vista, Ubuntu - and Linux in general - is very robust. It can run on relatively old computers. Therefore, there is no need for a legacy edition. But it can also run on full media centers without needing a new version of the operating system. 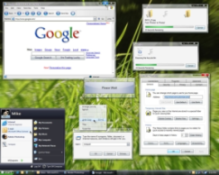 For the purposes of the general computer user, Windows Vista offers relatively few applications. Perhaps the two most significant features for most users was the new interface and the multimedia utilities. More advanced users might benefit from ReadyBoost and other special-purpose utilities. Anything beyond the basic functionality requires the purchase of additional software. With that comes software compatability issues. Ubuntu, on the other hand, comes with high quality, industrial-strength applications on the installation CD. These include a full office suite, a graphics package that has around 80% of the functionality of Adobe Photoshop, a full personal information manager that functions similarly to Outlook, instant messaging, and Skype-like Internet phoning. Using Ubuntu's built-in installation utility, one can select applications which the program will then find on the Internet, download, install, and configure at the click of a button. One of the great frustrations endured for some time by Linux users and Windows users alike was incompatability issues between the software and the operating system. Ubuntu gets around this by checking the dependencies of a program before it is installed. If a required package is not installed and needs to be, Ubuntu will offer to find it and install it first, and then continue installing the previously selected program. Ubuntu will run on just about any PC with greater than 180 Mb of RAM.For those computers with less than 180 Mb of RAM, Xubuntu is recommended. According to Microsoft, one must purchase a Vista Capable or Vista Premium Ready computer to run any edition beyond Windows VistaBasic. A Vista Capable machine has the following hardware at a minimum: 800 MHz processor, 512 Mb physical RAM, and a DirectX 9graphics card. A Vista Premium Ready computer has much more: a 1 GHz processor or better, 1 Gb physical RAM, and an Aero-compatiblevideo card that has at least 128 Mb of video RAM. These bare essential requirements are listed on Microsoft's website. While Ubuntu offers significantly more functionality immediately upon installation than Windows Vista does, the starkest point of comparison is price. As I write this, the entry-level Windows Vista Home retails for $198.78 (USD) at Wal-Mart. The Premium edition sells for $238.78(USD). Ultimate costs $398.99. Even an upgrade to Windows Vista Ultimate costs $258.88. Ubuntu, on the other hand, remains free of charge. You can download it or even request a free installation CD, sent to you wherever you live for free (no charge for the postage, even!). Return to "Ubuntu, Comparatively Speaking"